The hilariously prolific electronic deity that is Kieran Hebden has this morning via his Twitter effectively announced that he is to release an LP - and release it today. 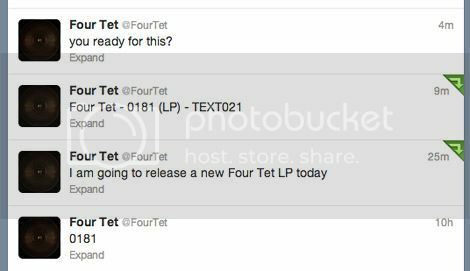 The hilariously prolific electronic deity that is Kieran Hebden has this morning via his Twitter effectively announced that he is to release an LP as Four Tet - and release it today. The LP, 0181, is now on his Soundcloud for download - produced by Kieran Hebden between 1997 and 2001 and compiled last year. A vinyl release is imminent.